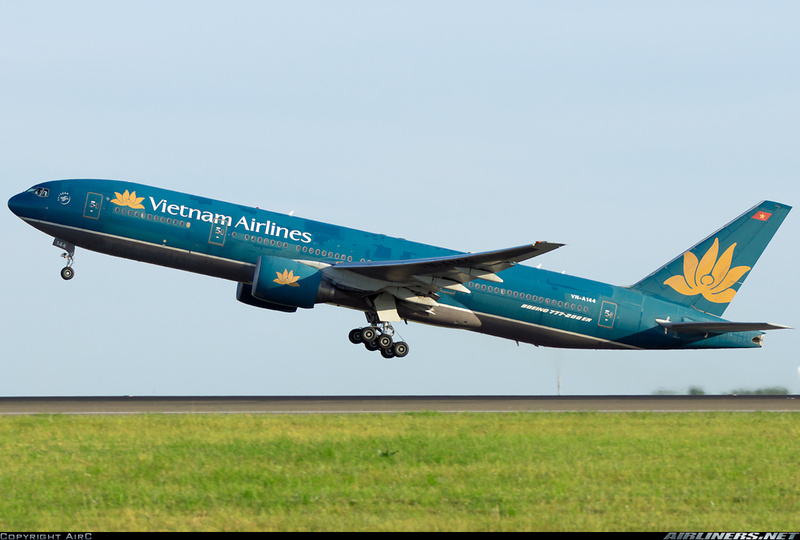 Welcome to my trip report on Vietnam Airlines Boeing 777 joyride! This is one of my many trip reports on Vietnam Airlines but its a significant one because after 4 attempts on trying to fly on the airline's Boeing 777, I accomplished it. Trust me, the days before my flight, I was quite worried, frequently checking the airline's website for any changes to my flight. 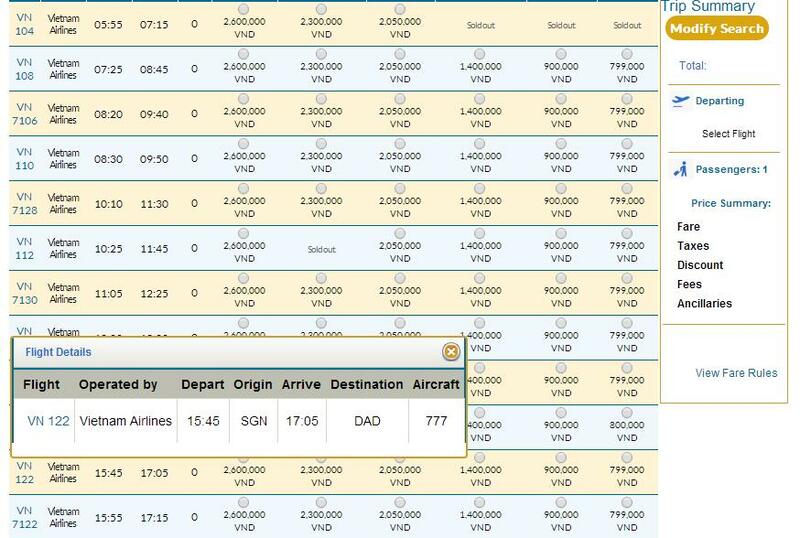 There had been changes on the Ho Chi Minh - Hanoi flights and it was a good thing I didn't go for that route because the flight I was originally looking at for this route was changed to A321! You can imagine how furious I would be if I was flying on that flight. Boeing 777 to Airbus A321! Noooooo. Da Nang was a city I always wanted to visit but for this time, I would be there for my flying trip as I have plans to go back there in the near future. So finally the day before I did the check in and I got what I want, the Boeing 777. I had the chance to pick a Premium Economy Class seat (row 15), but I wanted the window seat. Mobile check in was done successfully. My partner had the seafood spaghetti while I had the ID Cafe's special pork rice meal. A celebratory dinner with my partner at a Mediterranean restaurant. My partner had the roasted duck while I had the steak. We both agreed the steak was better. My breakfast at Yen's cafe - don't think I will return any time soon. Really good Vietnamese noodles at one of the local restaurants introduced by my partner. I spent the morning lazing around before making my way to the airport around lunch time. This has become a familiar sight to me as I made my way to the check-in counter. Do note that Vietjetair check-in counter is at a different location. For the international terminal, you can walk there. It takes only 10 minutes to do so. I tried using the self check-in kiosk but it failed. The helpful staff was clueless also and she directed me to the check-in counter. The very nice male staff assisted me and actually offered to change my seat to another row. I asked whether he could get me onto one of the Premium Economy window seats, but he couldn't find it. His patience and friendliness attitude was impressive, probably the best staff I encounter so far at this airport. While waiting, I did a check on which 777 would take me to Da Nang. VN-A144 was the only 777 on the way to airport at that time so my guess was this aircraft and it turned out to be. Once security and passport checks were done, I was at the air side. If you are curious whether you can play Pokemon Go at this airport, only the Pokemon Stops located at the taxi stand for this terminal. Hello, VN-A866! Nice to see you again! Gate 15-20 are for aircraft parked at the remote parking lots, usually for ATR-72 flights. Caught the 9000th Airbus A320 that day. At that time, my aircraft had arrived and was parked near gate 14 but my assigned gate was at 6 which was later change to 14 to my relief. 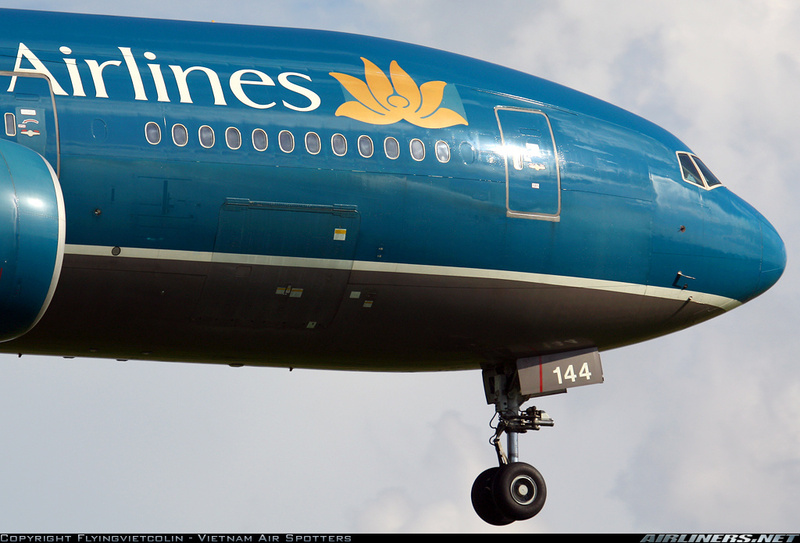 Nice to see you, VN-A144. This was supposed to my aircraft the last time I went to Ha noi, but was changed to the flight to the same destination. Got you this time. Announcement was made to board the aircraft, this gate was located at the last gate of the domestic terminal and when you walk there you can see the international terminal. I was happy to see the Boeing 777, to finally get this off my wishlist. Would have prefer to fly it on a longer sector. Once on board, I was greeted by the crew but most of them were just too similar to one another - cold looking and not a sign of enthusiasm in their jobs, sad to say. We pushed back on time and a Caucasian pilot came on the speaker to give us our flight details. When he mentioned about thunderstorm near Da Nang, I was a bit worried. However, the flight there was smooth especially the landing. It was a great day for flying in fact. For this short flight, only a bottle drink was served, can't complain for the price I paid and its the 777 I am after so doesn't matter to me. The flight was full and I sat beside 2 Vietnamese ladies who seemed a bit nervous about flying. Most of the passengers were local people, heading to Da nang probably for holiday. Nice to be able to fly a wide-body on this short domestic flight. Once we landed, we taxied to the remote parking lot and disembark from there. Da Nang airport isn't big, check out my photos of the airport in my return trip report. Difference between Premium Economy and Economy Class? Legroom space is better at the former. A couple of crew having a laugh or two, you should also do that to your passengers! Make us feel welcome. The rear of the cabin, good idea to have the crew's seat facing the front cabin. It was a good thing I board the aircraft early, that allowed me enough time to take photos of the Economy Class. This system is non AVOD meaning you can't pause/rewind/fast forward your program and they would be replayed after they are finished. Its like a loop. The good thing is there are a number of choices. Parked beside VN-A325 Airbus A321 aircraft, I flew this aircraft from Ho Chi Minh to Singapore few years ago. Pushed back and heard the familiar Pratt and Whitney engines starting up. Great day for flying! I spent a bit of time looking at the world passing by. There wasn't enough time to enjoy a movie anyway. See the issue here about the window? We touched down smoothly and taxied to the gate in less than 10 minutes. I knew at once we were parked at a remote parking lot. Spotted the other aircraft in the tarmac, we were the biggest in size. How huge the Boeing 777 is! Thanks for the ride, VN-A144! Welcome to Da Nang Airport! Walking to the arrival hall took less than 5 minutes. I am glad to have finally gotten Vietnam Airlines Boeing 777 and now I can concentrate to fly on Vasco and Vietnam Airlines' ATR-72 and after which I would complete the airline's fleet types. My visit to Vietnam as some of you readers know is now on a regular basis and I will look for other ways to get there. Qatar B787 and Mynamar International Airlines B737-800 are in my mind so stay tuned for that. This airline's Boeing 777 has outdated products and flying on them in Economy Class may not be comfortable with tight legroom space and outdated IFE system. The airline currently (August 2016) has 4 of this aircraft type and will be phrased out once more A350-900s entering the fleet. So if your flight is changed to this aircraft, don't be disappointed. This aircraft will soon disappear from our skies and it will be the Airbus A350 and Boeing 787 Dreamliner aircraft dominating the wide-body fleet. From what I heard, the Boeing 777 will be phrased out before the Airbus A330-200. (You can check out my A330 trip report over here. Apart from the cabin products, the Boeing 777 is a great aircraft to fly on, the existence of this aircraft is a primary reason why the Airbus A340-300, -500 and -600 series fail. Do check out my other trip reports on this airline and hope you enjoy them! 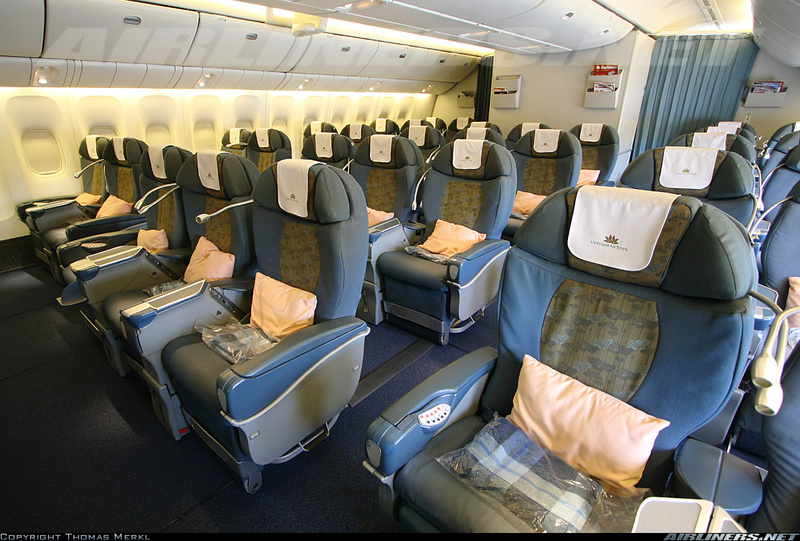 You posted 2 different Business class cabin photos, which one is the one that belongs to VN-A144? Yap, I have edited the report. Thanks! This is weird, Ive been on the 144 once and the Business class is different to the one you posted. I visited Vietnam last week and traveled domestic from SGN to HAN and back. I booked VN234 with the aim of flying with the A350 and VN235 for the B787. As luck wouldn't have it, I flew on the A321 and A330 respectively. The A330 looks more modern and cleaner than the B777 from what I have experienced. Great report! That's unlucky, but don't give up! You will get the both A350 and B787 eventually. The A330 you flew on is probably the newer A330, the airline also operates the A330 with old cabin, similar to the Boeing 777. 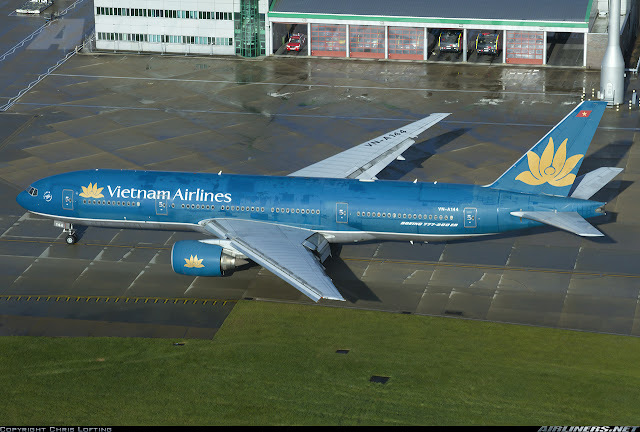 Charles the 777 of Vietnam Airlines is over. The last one flown to U.S to stored. We will miss the cool 777-200ER even the old IFE, seats, and even plane. I guess I saw the goodbye already. I track the plane and it landed at Greenwood Airport joining his brothers. That's sad to hear. The Boeing 777 has served the airline well! Thanks for the update. I think the 777X series may be too large for the airline but it would be great to see this aircraft in the airline's livery.